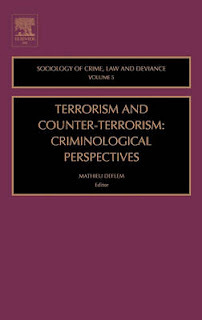 Introductory chapter published in Terrorism and Counter-Terrorism: Criminological Perspectives, edited by Mathieu Deflem. Amsterdam: Elsevier/JAI Press, 2004. Please cite as: Deflem, Mathieu. 2004. "Introduction: Towards a Criminological Sociology of Terrorism and Counter-Terrorism." Pp.1-6 in Terrorism and Counter-Terrorism: Criminological Perspectives. Amsterdam: Elsevier. Until September 11, 2001, terrorism and counter-terrorism were relatively underexplored topics in the sociology of crime and social control. Since then, however, new ground has been made in the study of terrorism and terrorism-related phenomena across the social sciences, including ground-breaking work from the field of criminological sociology. The chapters in this volume reveal the distinct contribution criminological sociologists have to offer in the study of terrorism and counter-terrorism from a variety of theoretical and substantive viewpoints. The discussions include a usefully broad selection of themes, including conceptual and methodological issues in the criminology of terrorism; ideology and terrorism; and responses to terrorism in domestic and international settings. Bringing together distinguished scholars from the field of criminological sociology, this volume presents a comprehensive and insightful state-of-the-art overview of terrorism and counter-terrorism scholarship with respect to important concerns of social control, crime, and law. Generally, terrorism has not been central to the discourse of criminological sociology (nor criminology in general). Since the terrorist incidents of September 11, 2001, however, terrorism has resolutely moved center stage in sociological and other social-scientific discussions. The contributions in this volume bring out the distinct contribution criminological sociologists have to offer in the study of terrorism and terrorism-related phenomena from a variety of theoretical, methodological, and substantive viewpoints. The history of terrorism and counter-terrorism as topics of sociological reflection is disappointingly straightforward. Until the events of September 11, only very few scholarly studies of terrorism and related issues had been conducted from a distinctly sociological viewpoint, while other social sciences were more prominently represented in the area of terrorism research. Most of the literature on terrorism and counter-terrorism in the social sciences comes from political science, international studies, and law. Political scientists particularly focus on the relationship between terrorism and the planning and implementation of policy programs against terrorism (Heymann 2003; Laqueur 2003). Terrorism connects intellectually with the interests of international studies scholars who investigate terrorism and counter-terrorism in terms of the manifold interconnections between nations and other localities (Brown 2002). Scholars of law, finally, approach problems of terrorism and counter-terrorism in the two specialty areas of international law (Lippman 2003) and criminal law (Demleitner 2002). The social-scientific scholarship on terrorism has also focused on the study of counter-terrorism, conceived as the policies and practices defining and responding to terrorism. The literature has focused on counter-terrorism mostly as one aspect of a broader terrorism focus in relation to national legislation and international policy (Crenshaw 2001; Sterba 2003). Much less discussed have been the dynamics of the strategies employed to fight terrorism at the level of police organizations (Deflem 2002, 2003; Henry 2002). Insights on terrorism in the social-science disciplines of political science, international studies, and law are highly relevant, but a distinctive tradition of a sociology of terrorism is sadly missing, despite the occasional exceptions (e.g., Deflem 1997; Gibbs 1989; Juergensmeyer 2000; Smith 1994; Turk 1982). Since September 11, however, the number of contributions on terrorism and counter-terrorism has expanded exponentially across the social sciences, including sociology and criminology (e.g., Beck 2002; Etzioni 2002; Webb 2002). Providing a clear indication of this sharp rise in attention, a search for terrorism-related articles in the bibliographical database Ingenta uncovered a total of 971 articles on terrorism published since 1997, no less than 785 of which appeared after September 11, 2001 (end-date: October 6, 2003). Likewise, the Library of Congress holds some 31 terrorism-related books published every year from 1990 to 2000, but that number rose to 60 in 2001, 93 in 2002, and already 98 book publications on terrorism by the Fall of 2003 (end-date: October 6, 2003). Clearly, much valuable research, analyzing the course and conditions of various terrorism issues, is now underway. To ensure more than fleeting interest for the sociology of terrorism and terrorism-related phenomena, it will be important that sociologists build on their proven disciplinary insights in theoretical, methodological, and other relevant respects. At the same time, given the differential development of terrorism and counter-terrorism across the social sciences, criminological sociologists should not be embarrassed to learn from other research disciplines. Then they will be able to provide a distinctive and useful contribution to the scholarship of terrorism and counter-terrorism in the context of important themes related to crime, law, and social control. Indeed, it is the specific province of criminological sociology to study the manifestations of crime and social control, including terrorism and counter-terrorism, in relation to their conditions, processes, and implications at the societal level (Rosenfeld 2002). The chapters in the present volume seek to contribute to this ambition in a variety of ways. The chapters in this volume are presented in three parts. The contributions in Part I discuss important theoretical foundations in the study of terrorism from the viewpoint of criminological sociology. Donald Black’s insightful and provocative chapter develops a notion of terrorism as a form of unilateral self-help by organized civilians, involving the covert infliction of mass violence on other civilians. Various characteristics of terrorism are highlighted on the basis of this conception, suggesting the violent nature of terrorism, its kinship to warfare, and the ultimate demise of terrorism. In the next chapter, Richard Rosenfeld critically relies on Black’s notion of terrorism to argue that terrorism combines elements of predatory and moralistic violence in attacks on societies characterized by capitalism, democracy, and a culture of religious tolerance. Terrorist violence is motivated by an anti-modernist impulse and is only symbolically elevated over other, everyday forms of violence. Gregg Barak extends the theoretical discussion by conceptualizing three forms of terrorist-like behavior: killer boys, suicidal terrorists, and genocidal exterminators. Barak applies the Reciprocal Theory of Violence to broaden our understanding of terrorism in terms of individual, institutional, and structural types of behavior. In Part II, chapters are brought together that focus on some of the important methodological issues that are to be dealt with in terrorism research. Comparing crime and terrorism with respect to conceptualization, data collection, and research methodology, Gary LaFree and Laura Dugan find that many of these important issues also apply to terrorism research. The authors therefore argue that the application of criminological methods to the study of terrorism would critically contribute to our understanding of terrorism. Kelly Damphousse and Brent Smith suggest the value of the American Terrorism Study as a basis for empirical data to be used to develop and test theories of terrorism. More specifically, Damphousse and Smith find that the data of the American Terrorism Study indicate that terrorist groups have became smaller and that the number of counts per indictment increased after the advent of leaderless resistance in the groups. Likewise, Michael J. Thomas relies on a specific data set to analyze terrorism-related phenomena, critically focusing on the manner in which the United States government categorizes and classifies terrorist groups. Thomas argues that the current systems used by the U.S. government do not comprehensively categorize terrorist groups and do not adequately address the motives of international terrorism. New classificatory schemes would have to be developed to overcome these shortcomings. In the final methodological chapter of this volume, Margaret Zahn and Kevin Strom usefully analyze the investment in terrorism-related research before and since 9/11. Zahn and Strom find that the relative share in federal funds spent on social-science research is still small and that such research has shifted attention from the study of the consequences of the 9-11 attacks to the improved prediction and understanding of terrorism. Part III of this volume deals with aspects of counter-terrorism policies with respect to important concerns related to ideology and governmental strategies of security. Willem de Lint highlights the role of public relations, secrecy, and executive power in a reconceptualization of autocratic rule that the author refers to as endarkened governance. On the basis of an analysis of the ‘unlawful combatants’ held in Guantanamo Bay, Cuba, de Lint assesses the impact of the events of 9/11 and the political ideology of neoconservativism, which, he argues, is not helpful to build a sound counter-terrorism policy. Bonnie Berry draws parallels between far right terrorist groups and, what she calls, the U.S. right-wing political establishment. The false promise of security, Berry argues, refers to the White House avowal to protect the post-9/11 public without any real or effective measures to ensure public safety. The author concludes that such absence of real security is congruent with a desire to control the public through fear. In Part IV, finally, we offer chapters that touch on the construction and reality of terrorism in the political and ideological contexts of modern societies. Victor Kappeler and Aaron Kappeler examine the construction of terrorism in the United States as a moral panic. Focusing on the speeches used by political figures and law enforcement officials, the Kappelers find several rhetorical themes in the discourse on terrorism that are consequential not only for everyday perceptions, but also for the criminology of terrorism. In the final chapter, Paul Leighton argues that criminologists should think about terrorism in a new way by returning to and updating the notion of “The Challenge of Crime in a Free Society” introduced by the President’s Commission on Law Enforcement and Administration of Justice in 1967. Without such a rethinking, Leighton fears, criminological research on terrorism will remain involved with technically well-executed, but only marginally relevant work. The chapters in this volume, of course, will hopefully exemplify a different and more profound approach. Beck, Ulrich (2002). The Terrorist Threat: World Risk Society Revisited. Theory, Culture & Society 19(4), 39-55. Brown, C. (2002). The “Fall of the Towers” and International Order. International Relations 16(2), 263-267. Crenshaw, Martha (2001). Counterterrorism Policy and the Political Process. Studies in Conflict & Terrorism 24(5), 329-337. Deflem, Mathieu (1997). The Globalization of Heartland Terror: Reflections on the Oklahoma City Bombing. The Critical Criminologist 8(1), 5. ____ (2002). Law Enforcement 9-11: Questioning the Policing of International Terrorism. Pro Bono 9(1), 5-9. Demleitner, Nora V. (2002). Immigration Threats and Rewards: Effective Law Enforcement Tools in the “War” on Terrorism? Emory Law Journal 51, 1059-1094. Etzioni, Amitai (2002). Implications of the American Anti Terrorism Coalition for Global Architectures. European Journal of Political Theory 1(1), 9-30. Gibbs, Jack P. (1989). Conceptualization of Terrorism. American Sociological Review 54(3), 329-340. Henry, Vincent E. (2002). The Need for a Coordinated and Strategic Local Police Approach to Terrorism: A Practitioner’s Perspective. Police Practice and Research 3(4), 319-336. Heymann, Philip B. (2003). Terrorism, Freedom, and Security: Common Sense for a Democratic Society. Cambridge, MA: The MIT Press. Juergensmeyer, Mark (2000). Terror in the Mind of God: The Global Rise of Religious Violence. Berkeley, CA: University of California Press. Laquer, Walter (2003). No End to War: Terrorism in the 21st Century. New York; London: Continuum. Lippman, Matthew (2003). The New Terrorism and International Law. Tulsa Journal of Comparative & International Law 10, 297-368. Rosenfeld, Richard. (2002). Why Criminologists Should Study Terrorism. The Criminologist 27(6), 1,3-4. Smith, Brent L. (1994). Terrorism in America: Pipe Bombs and Pipe Dreams. Albany, NY: State University of New York Press. Sterba, James P. (2003). Terrorism and International Justice. New York: Oxford University Press. Turk, Austin T. (1982). Political Criminality: The Defiance and Defense of Authority. Beverly Hills, CA: Sage Publications. Webb, Gary R. (2002). Sociology, Disasters, and Terrorism: Understanding Threats of the New Millennium. Sociological Focus 35(1), 87-95. See book overview and pdf copy!